Finance is one of the most crucial elements of today’s capitalist society -- it can mean salvation for some and suffering for others. The upcoming film “Money” will look into this paradox. 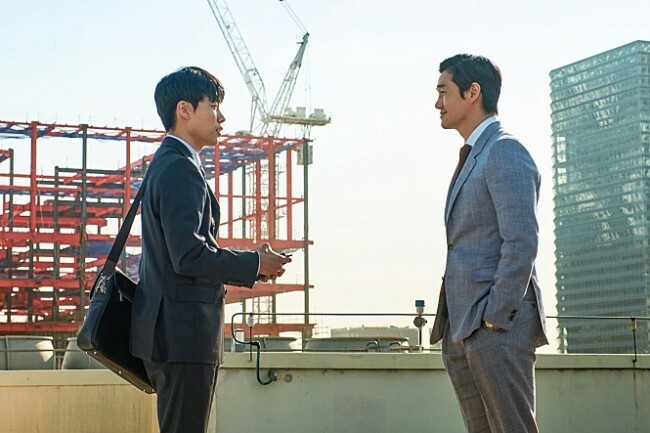 The film, starring Ryu Jun-yeol, Yoo Ji-tae and Jo Woo-jin, is about a budding stockbroker who is tempted to make big bucks by taking part in shady stock transactions. Ryu -- already taking on a second starring role very early this year after “Hit-and-Run Unit” -- plays the young broker Jo Il-hyeon, who gets what he sees as the chance of a lifetime. “(Jo is) a man who grew up in an ordinary household and lands a job. He has a dream of becoming rich,” the actor said before going on to discuss how his manner and facial expressions reflect the changes that Jo undergoes. “As I shot the film, I came to realize the changes that people go through before and after getting money. The human tendency to succumb to (the temptations of money) can make a person so miserable,” he said. This time, Yoo is the one playing the bad guy. But his character, “Beonhopyo,” which literally means queue ticket, is not really a straight-out “evil” person -- instead, he operates in a morally gray area. Yoo has played iconic villains before, arguably the most memorable being Lee Woo-jin in Park Chan-wook’s masterful 2003 “Oldboy.” Like Lee, Beonhopyo has a calm and well-mannered demeanor, but Yoo said he’d tried his best to prevent his character from looking like just another villain. “When used right, money can be good. But when used wrong, it can devastate your life. I think my character is one that expresses that aspect (of money),” he said. The antagonist, a government official named Han Ji-cheol from the agency in charge of the financial sector, is played by Jo. In several of his best-known appearances, he was the most infuriating figure on the screen, but this time he plays an ordinary person with a strong will and his heart in the right place. “Each person in the film has a different perspective on money, and the way they clash plays into its appeal,” he said. Park expressed hopes that her first feature film would give the audience something to think about. “Money” hits local theaters in March.